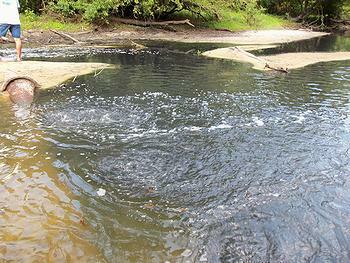 STATESBORO, Georgia, July 24, 2012 (ENS) – A county judge has handed the nonprofit conservation group Ogeechee Riverkeeper a victory in its efforts to stop a Chicago-based textile manufacturer from discharging pollutants into the Ogeechee River. On July 19, Bulloch County Superior Court Judge John Turner overturned a consent order between the Georgia Environmental Protection Division and King America Finishing that allowed the textile company to continue polluting the river even after the chemicals it discharged had killed thousands of fish. Judge Turner reversed the ruling of an administrative judge in Atlanta earlier this year that rejected the public’s right to comment on the issue and also rejected the legal challenge Ogeechee Riverkeeper mounted against the consent order. The judge’s decision invalidates the consent order and sends the case back to the administrative court. “The consent order was executed with no chance for involvement by the public and it was inadequate to rectify the harm that had been caused or to keep it from happening again,” said Brown. In May 2011, 38,000 dead fish were found along an 85 mile stretch of the Ogeechee River below the King America discharge pipe. Government investigators concluded the fish kill was likely caused by a combination of unseasonably high water temperatures, drought that impeded river flows and three chemicals, ammonia, formaldehyde and hydrogen peroxide illegally discharged by King America. Following the kill, the Georgia Environmental Protection Division and King America entered into a consent order in which the company agreed to pay $1 million for environmental projects on the river. Ogeechee Riverkeeper maintains that this order still allows the company to discharge unsafe levels of the chemicals. The environmentalists calculate that state law could levy more than $90 million in penalties against King America. Represented pro bono by GreenLaw and by Stack and Associates, Ogeechee Riverkeeper filed a challenge to the consent order with the Office of State Administrative Hearings in Atlanta. A judge there ruled that the public had no right to comment upon the consent order before it was finalized and that Ogeechee Riverkeeper did not have standing to challenge its provisions in court. Ogeechee Riverkeeper appealed this ruling to Judge Turner. “Judge Turner recognized that any backroom deal reached without the light of public participation can only continue to harm not only the river but all of us who still believe that we should have a voice in our government,” said attorney Don Stack.